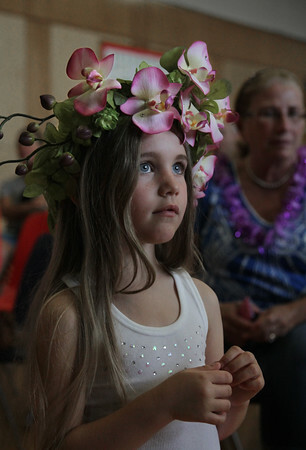 Five-year-old Kiki Cook watches a presentation on Pacific island dance forms Monday during a "Hawaiian Hula Dance Party" at Essex Elementary School. The event, hosted by the T.O.H.P. Burnham Library to coincide with its Hawaiian-themed summer reading program, was presented by dancers from the Rhode Island-based Polynesian Fusion. After learning about hula and other forms of Polynesian dancing, the children were invited to dance along with the instructors.